BUEA, Cameroon, October 19, 2014 (ENS) – Cross River gorillas, the world’s rarest apes, have a newly protected area that will better enable these unique primates to survive as a species. Prime Minister of Cameroon Philemon Yang Friday signed a Decree to officially create the Tofala Hill Wildlife Sanctuary in South West Cameroon. Located in the mountainous northeastern part of South West Province. The new sanctuary has a surface area of over 8,000 hectares, nearly 31 square miles. The rainforest in this area is considered a global biodiversity hotspot. Besides the Critically Endangered Cross River gorilla, this land is inhabited by the most endangered African chimpanzee, the Drill and other endangered wildlife, such as elephants. While all western gorillas are classified as Critically Endangered – in the case of the Western Lowland Gorilla due in part to Ebola virus – the Cross River gorilla is the most endangered of the African apes. It is one of the world’s 25 most endangered primates according to the International Union for the Conservation of Nature’s Primate Specialist Group. Tofala Hill Wildlife Sanctuary is the third protected area fully designed to protect Cross River Gorillas, after Cameroon’s Takamanda National Park and Kagwene Gorilla Sanctuary, both created in 2008. Great apes and other wildlife species are under pressure from hunting and the bushmeat trade, as well as habitat loss due to human encroachment. Habitat fragmentation due to the expansion of agriculture and palm oil plantations is one of the biggest threats to great ape conservation in the forest. Indirect pressures include local poverty and the absence of a regulated law enforcement system. Although great ape conservation activities by fieldworkers proved to be effective, conservation threats will only be sustainably reduced when the number of local anti-poaching staff is increased and the conservation areas become effectively gazetted by the government, says the African Conservation Foundation, which has worked and advocated on behalf of the Cross River gorilla for years. “The establishment of the new Cross River gorilla sanctuary is an exciting and important milestone and achievement for the local team,” says Arend de Haas, director of the African Conservation Foundation. Since 2004, the African Conservation Foundation has been working in a partnership with the Environment and Rural Development Foundation in the Tofala-Mone Forest Landscape. Major successes include the discovery of new Cross River gorilla populations in the Tofala-Mone Forest Corridor, the launch of a great apes monitoring program, the creation of community management structures and successful education and livelihood projects in the project area. 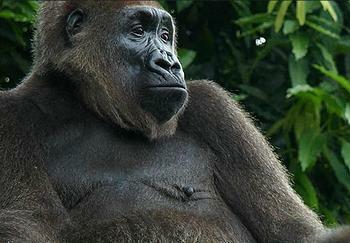 The Cross River gorilla is the most western and northern form of gorilla. Cross River gorillas differ from other lowland gorillas in their physical appearance, their diet and local tool use and their more terrestrial lifestyle. “Fragmented gorilla and chimpanzee populations, if not linked through appropriate biological corridors, are prone to inbreeding and diseases,” says Louis Nkembi, president of the Environment and Rural Development Foundation. “Genetic inbreeding may very rapidly lead to the local extinction of these globally important species,” Nkemi said. The corridor project is intended to lead to a genetic linkage between the different great ape populations. It expected to increase community involvement in the management of the conservation units in the area. Tofala Hill Wildlife Sanctuary would not exist without the financial support of private donors and supporters. The project partners would like to thank the Taipei Representative Office and the Taiwan Forestry Bureau for their continued support and commitment to Cross River gorilla conservation.